Game Changer in Moto GP. Championship Lead Changes at Silverstone. You are here: Home › Game Changer in Moto GP. Championship Lead Changes at Silverstone. 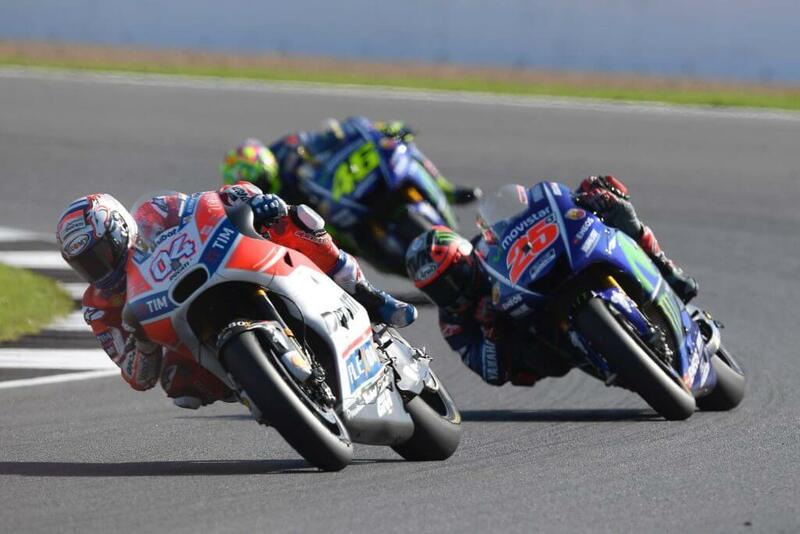 Ducati leads the 2017 MotoGP Championship after Andrea Dovizioso won the British Grand Prix at Silverstone last Sunday. With seven laps to go it was all Honda’s Marc Marquez, Yamaha’s Valentino Rossi and Maverick Vinales and Dovizioso in the leading group. Then Marquez’s Honda engine blew up leaving the two Yamaha’s and the Ducati to swap places, until three laps to go when Dovizioso passed Rossi to go on and win his fourth GP in 2017. Spain’s Maverick Vinales finished second, relegating Rossi into a third place podium spot. Italy’s Andrea Dovizioso is now nine points clear of Marquez with Vinales also back in the title hunt, now only four points behind Marquez. Britain’s Cal Crutchlow was fourth on his Honda. The next race is in Misano, Italy on 10 September. next post: LAST CHANCE TO OWN A BMW HP4 RACE. ONLY 4 LEFT!